Home BUSINESS The current economic recession forces society to extend loan repayment period. The current economic recession forces society to extend loan repayment period. 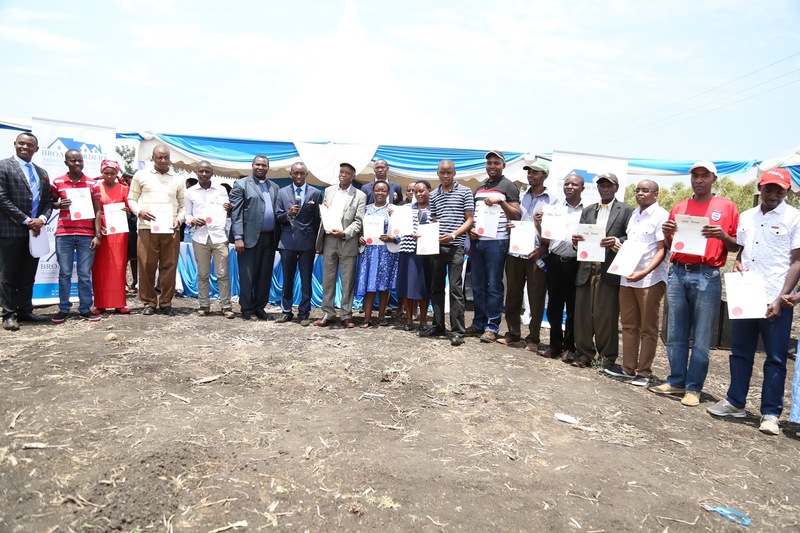 Broad Borders Chairman Jeremy Karemeri Mwangi pose for a group photograph with a section of the 1,000 members who received their title deeds at the cooperative's 41st project in Sagana. Broad Borders Housing Cooperative Society has reviewed downwards its terms of credit to cater for members who have been negatively affected by the current economic recession due the political temperatures in the country. While issuing about 1, 000 title deeds to members, Chairman Jeremy Karemeri Mwangi reckoned that a substantial number of its members had accrued some debt backlogs and it was only prudent they were assisted in payment. Karemeri said that, as a society, they had been forced go back to the drawing board to avoid running into massive losses resulting to debt defaults. “We have opted to extend the mandatory loan repayment period. Our members can now enjoy a grace period of two more months before completing to paying instalments for the purchase of land from the normal three months to five months,” explained Karemeri. The company will next month break ground for the construction of hostels at a 2 acres’ piece of land that is purchased near Murang’a University. This project is geared towards addressing the housing problem within Murang’a Town. Karemeri said that the cooperative was taking advantage of the increase in student population especially after Murang’a University’s recent admissions of over 1, 000 students. Students have been having a hard time accessing quality and affordable accommodation forcing them to live in less habitable and risky conditions. The firm, he added, will start with 107 units of Sh.650, 000 each that can accommodate six students. Members expect to earn Sh.20 000 per month after the project is complete. Karemeri pointed out that Broad Borders are also pursuing other frontiers and will soon invest in other counties and put up similar projects. They also plan to diversify their investment programmes by including both commercial and agribusiness in their menu.